replaced completely, rather than spliced. Bolt holes should be carefully placed for proper alignment. When wood braces are fastened to piling, the pile should not be cut to obtain a flush fit. The braces should be bolted, if possible, above the high waterline. After bolt holes have been drilled, they should be treated with preservative, preferably with a specially designed bolt hole that forces the preservative into the hole under pressure. 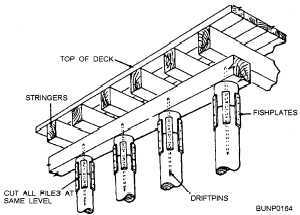 Where decking has been removed for repairs, it is often possible to drive brace piles to provide lateral stiffness. This eliminates all bolt holes except at the top of the structure immediately under the decking. Fire curtain walls that have rotted or that have been damaged or severely attacked by marine borers should be restored to the original condition. When damaged timbers are replaced, they may be spliced out. Splices should not be made in the same location on both sides of the wall because an open crack would remain. The curtain wall should be as airtight as possible after repairs are completed. Wood fire curtains are usually made of two layers of timber - the joints in one layer running diagonally to the joints in the other. It is important that the joints be tight and that both sides of the wall be completely repaired. Figure 7-21. 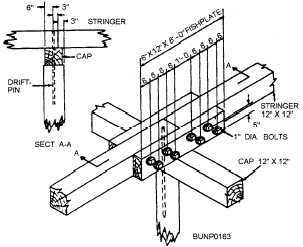 - Stringer splice. Figure 7-22. - Replacing top of piles. down through the new section of pile. This involves the removal of some of the deck planking. In every case, fishplates of metal or treated wood should be used to hold the new section in place. Fasten the fishplates securely with spikes, lag screws, or bolts. Where all the piles in a bent have decayed tops but there is less than a foot of unsound piling, the method shown in figure 7-23 maybe used. The top of each pile in the bent is cut off to allow the installation of an additional 12-inch by 12-inch cap under the existing cap. Drive the driftpins through the caps into the piles to hold the tops in place. 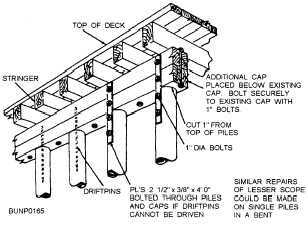 In most cases, the connection of the caps to the piles should be further strengthened by bolting them together with 1-inch bolts and 12 1/2-inch by 3/8-inch steel straps. Use 1-inch bolts for bolting the two caps together. Figure 7-23. - Repair of top of piles.